Hastings Vegan Dining Club Christmas Buffett! Savouries, starters & mains: Tomato, Cucumber & Basil salad; Rice, Lentil and roast aubergine salad; Alfalfa sprouts; roasties; coleslaw; falafel & rice balls; lentil lasagne; vegetable strudel; baba ganoush; tofu & walnut dip; hummous; chestnut pie; tempeh. 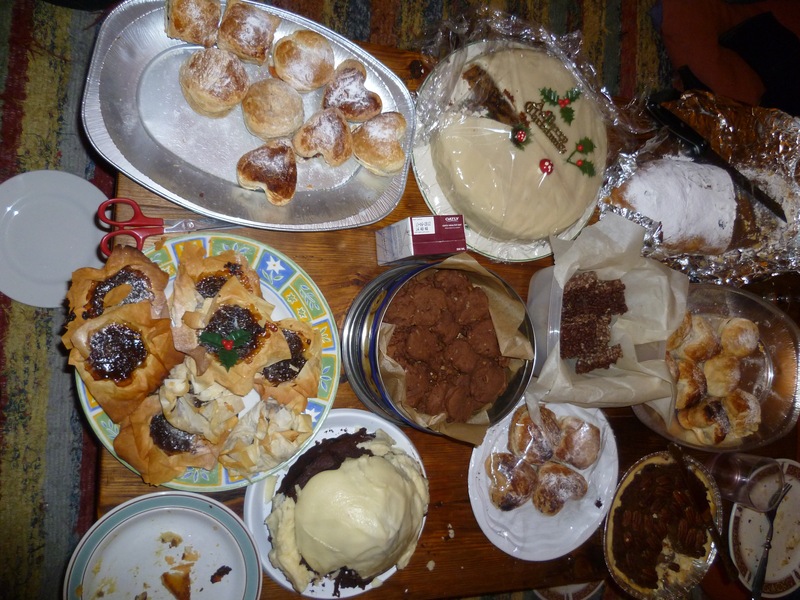 Deserts: pastry filled with chocolate ganache and pink custard; Xmas cake; choc & banana cake; mince pies; stollen; choc cookies; choc crispy squares; toffee pecan pie. 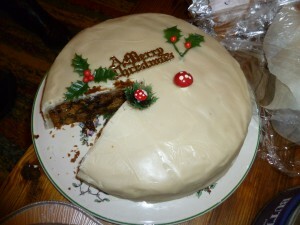 The Hastings Vegan Dining Club Christmas Cake! Drinks: Mulled wine; HSB–Hastings Brewery locally brewed vegan beer. Sadly, the Grumpy Vegan couldn’t make this meal. He is, therefore, grateful to the other (‘nice’) Kim for making notes and taking photos!